A redheaded wench intended to be sold off to pirates on the “Pirates of the Caribbean” ride in Disney World, Disneyland and Disneyland Paris is getting a major promotion: she’s gonna be a swashbuckling pirate too! Hooray! “You’ll even discover that a familiar character is playing a new role joining the pirates ranks and helping the local townspeople ‘unload’ their valuables at the Mercado auction,” reads the Disney blog post about the change. I wonder if she’ll get a real name now too? “Our team thought long and hard about how to best update this scene. Given the redhead has long been a fan favorite, we wanted to keep her as a pivotal part of the story, so we made her a plundering pirate!” Kathy Mangum, senior vice president of Walt Disney Imagineering, said in a statement to the OC Register. Previously, Disney has changed a scene in which pirates creepily chase women to pirates chasing women holding plates of food instead. 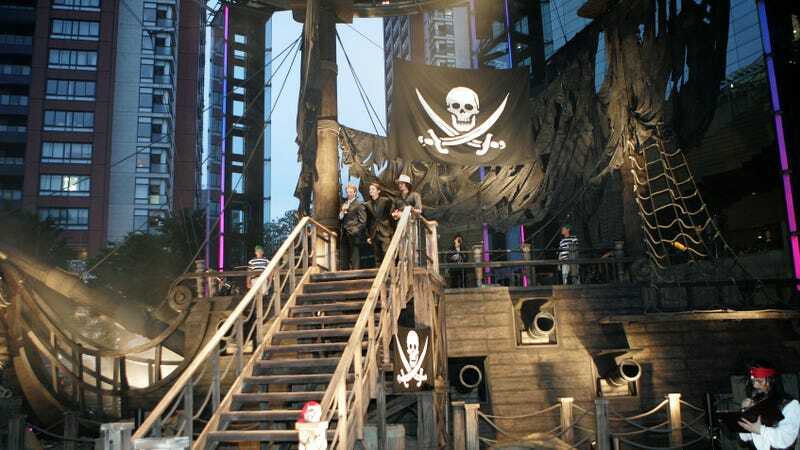 “YES, they ARE pirates, but the point of the attraction has always been about showing the FUN, romanticized side of piracy,” writes another commenter named Fred. Ah yes, the FUN, romanticized side of piracy.